It's time for our latest RELEASE from C.C. Designs and DoveArt Studios. Have you tried combining the C.C. Designs stamp line (or digi) with the DoveArt Studios stamp line? This was so super fun to color and create! We want to give you a chance to win one of these new stamps so let's get ready to HOP! Each of the DoveArts Studios Design Team members (and Sue the special guest designer) will be sharing their inspiration with gorgeous projects that feature every one of these new stamps! 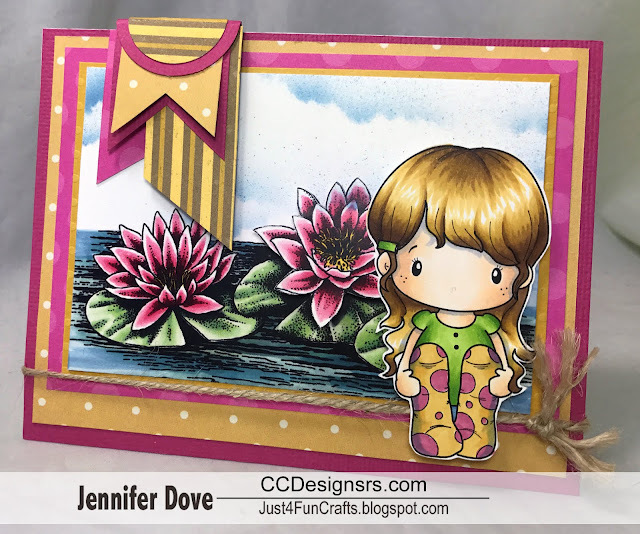 You can find the Lilly Pads stamp HERE as well as the rest of the collection. We would love to see what you combine. I hope you enjoyed this hop and seeing all the inspiration along the way. We appreciate your love for the DoveArt Studios line and hope you continue to enjoy them for all times. 1. Visit each design team member's blog (Blog roll below). 2. Leave a comment on each blog. 3. When you reach the end of the hop, you will be at DoveArt Studios blog. There you will leave the name, or names of your favorite stamps in the release. Come back on Sunday morning to DoveArt Studios blog to see if you won a stamp or two from C.C. Designs. We hope you enjoy!! Get ready to be inspired! !